To keep pace with the rapidly evolving electronics industry requires unwavering passion and urge to innovate. 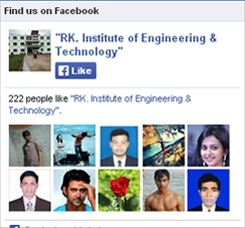 This, precisely, is what the Department of Electrical Engineering at the RKIET, Cuttack is about. The Department of Electrical Engineering is one of the largest departments on the campus, comprising of students, faculty and technical staff. The broad spectrum of courses is taught by a group of highly-experienced faculty. The syllabus – rigorous in design and content – is in keeping with the latest developments in the industry. Well-equipped laboratories coupled with extensive practical work ensure the student receives a well-rounded education.